On the west side of Bath Street was the Old Harrow Inn. In the 1870’s and later this was at 14 Market Place. At that time the only entrance to the inn was up the slight slope from the Market Place. The wall in Bath Street was a blank one. 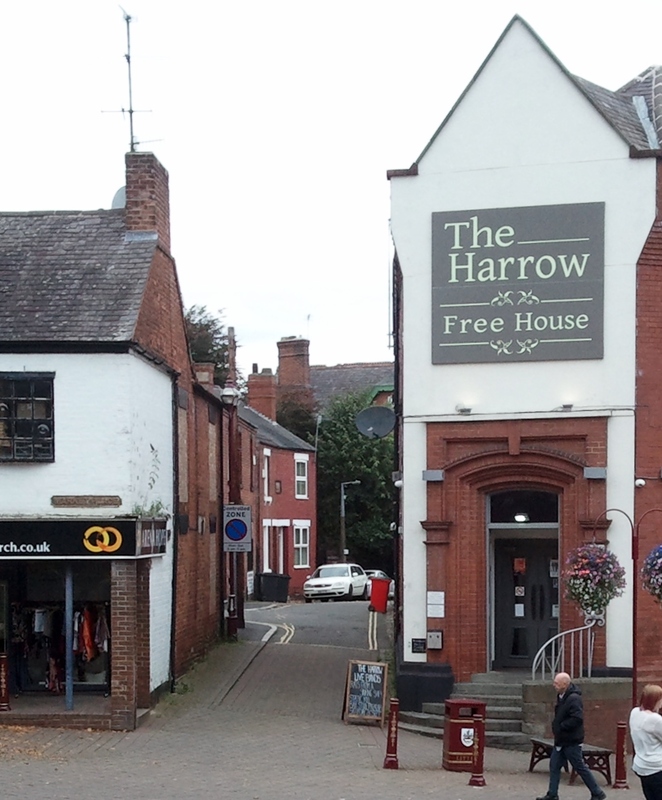 The old Harrow sign hung at the corner of the two streets, and the inn itself stretched further out into the roadway. Sheddie Kyme thought that the hostelry, with its colour-washed walls, and swinging sign on the corner, might be described as one of the most noted inns of the town. The reasons for this may be the very prominent position which it occupied in entering the market from Bath Street, with its sharp corner jutting into the roadway … a sharp corner that could prove very dangerous for pedestrians and vehicles alike. Traffic warning. September 2nd 1873. Aboard his horse and carriage, furniture dealer William Alfred Whitchurch of South Street ‘sped’ through the Lower Market Place and around the Harrow Inn corner into Bath Street. Unfortunately, in his way was a daughter of collier William Jeremiah Bestwick of Wheatley’s Row. Onlooker William Bostock shouted a warning to the child but it was too late. A wheel caught her, knocked her down and ran over her, and the carriage ‘sluthered’ to a halt several yards further on. Still alive but badly bruised and with one ear severely injured the child was carried home, where she was attended by Dr. Robert Wood. A month later and William Alfred was sued at court. Witnesses, druggist William Merry and grocer Samuel Lowe, both considered that the defendant was driving furiously — at least ten miles an hour – though William Alfred described it as ‘a moderate pace’, stating that the girl had run out in front of him, that he tried to stop, and that it was purely an accident which nobody could have prevented. For that unavoidable accident the dealer was ordered to pay £1 11s damages and costs. The Inn’s spacious yard — now taken up largely by St Mary Street (above) — adjoined the house in the rear and here many activities took place and attractions appeared. In fact anything in those days was considered an attraction by the boys, from an auction van to a marionettes’ display. One such ‘lure for the lads’ was Tom Payne’s travelling theatre, the members of which performed modern plays like ‘The Corsican Brothers’ (by Alexander Dumas 1845) and ‘The Colleen Bawn’ (a tale of love and intrigue by Dion Boucicault, 1860), as well as many old fashioned dramas like ‘Maria Martin, or the Murder in the Red Barn’, a melodrama based on the true story of the murder of a young girl in 1827. ‘Two souls with but a single thought, two hearts that beat as one’. (Ilkeston had its own, real-life, ticket-of-leave man in the form of Thomas Garrett whom we shall meet later… See Clarkson, Tooth and Pickburn). Another attraction for the local lads was any opportunity to win a few ‘chance’ pennies. For example, in October 1874 Tom Brooks brought his game of Two Pins to the yard and challenged the assembled group of juveniles to knock both pins down with one ball. A Penny a Go !! He persuaded several lads to try their luck and they obviously hadn’t realised that the pins were sufficiently far apart to make the task impossible. When he was arrested for gaming he had seven or eight shillings on him – that is enough pennies for up to 96 ‘Goes’. Tom spent the next month in jail. “There was a time when the Old Harrow yard was notable for pedestrianism. Professional handicaps in Mr. Joseph Aldred’s day were very frequent and attracted many people. Some of the sprinters, I remember, in addition to Mr. John Tilson (alias Bellows), were some of the Eatons, including ‘Spanker’, who, I believe is now at Southwell, and William Spencer. Professionalism was more to the fore in those days, and much money would change hands in stakes on the various heats. I believe it was in this cinder track that Spencer first made his appearance as a sprinter, but he afterwards succeeded in securing one of the Sheffield handicaps, as many Ilkestonians will remember”. ‘Spanker’ was possibly twisthand Ezekiel Eaton, the son of framework knitter Edmund and Ann (nee Winfield) whom we shall meet in Extension Street. Ezekiel left Ilkeston with his family in the later 1890’s to work in Southwell. And from the Nottinghamshire Guardian, August 1876, under the heading ‘Pedestrianism at Ilkeston’. “On Monday a walking match took place at Mr. J. Aldred’s Recreation Ground, Market-place, Ilkeston, in which Frank Bradley (Perkins’ novice), of Nottingham, undertook to walk fourteen miles in two hours. The ground measured was 200 yards round, and 122 laps were required to make up the fourteen miles. “Bradley started at 6.53 p.m. and completed the first seven miles at 7.49¾, or 3¼ minutes under the hour. He continued walking at a good pace, but when he had completed 31 laps of the remaining 7 miles it was almost dark, and as he complained of his feet being sore he was persuaded to relinquish the task at 8.23 p.m., having completed 10 miles 911 yards in one hour and a half. When he had eleven laps of the first seven miles to walk George Williams, of Ilkeston, started to walk seven miles with him, and continued after Bradley left the ground, our parcel being despatched before the result was known. “On Saturday evening last Bradley undertook to walk 7¼ miles in one hour for a bet of £25, which he managed to complete with one minute to spare”. The landlord was Joseph Aldred. He had two sons, Joseph and Aaron. The landlord of the Old Harrow Inn in 1850 was Thomas Marson. However the landlord to whom Adeline refers was Joseph Aldred the second, the younger son of Joseph the first and Amy (nee Knighton). Joseph the first was also a publican, for many years at the Rose and Crown in Cotmanhay. He was born in Horsley Woodhouse in 1787, the son of coalminer Robert and Ann (nee Fletcher). Joseph the second left Cotmanhay in the late 1840’s to return to New Brinsley, his place of birth, where the 1851 census finds him as a licensed victualler and grocer, with his wife and two young sons, Robert, born in Ilkeston, and Joseph, born in Heanor. In 1847 he had married Elizabeth Beard and returned to Ilkeston in the early 1850’s to trade at the Old Harrow Inn. With him and Elizabeth were two sons, Joseph and Samuel… there was no ‘Aaron’. In 1872 auctioneer Frederick Paling — brother of Eliezer — was advertising the Inn for sale and described it thus …..
With wine vaults, four cellars and a brew house, it had a frontage to the Market Place of 35 feet and to Bath Street of over 101 feet, and with it was to be sold outbuildings and the large yard ‘from which is derived a good annual income from theatres, menageries, and other exhibitions’. There was a sizeable garden stocked with fruit trees, its own greenhouse, stables and piggeries, and a large well ‘with an inexhaustible supply of pure water’, always a very useful asset when brewing beer on the premises. The Aldreds stayed at the Inn until Elizabeth died there in October 1875. In June 1876 Joseph the second remarried to Jane Hardy, the widow of journeyman miller William Hardy and the daughter of shepherd Edmund Gascoyne and Mary (nee Brackenbury? ), of Hougham, Lincolnshire. Early in 1881 Joseph left behind Ilkeston and his old trade and headed for Ecclesall Bierlow, Sheffield, where he set up as a grocer. Joseph died there in April 1886, aged 64. In March 1876 the licence of the inn was transferred from Joseph the second to his son Joseph the third. In February 1875 Joseph the third was looking at the new forge at Gallows Inn when sparks of red hot iron flew into one of his eyes and eventually caused blindness in both. Thankfully the affliction was temporary. Leaving the inn a customer would pass through an inner door, along a short passage to an outer door and then down a steep series of steps. In June 1878 these steps were very poorly negotiated by butcher William Toplis — alias ‘Saturday’ — of Chapel Place off South Street (and brother of basket maker George), and as a consequence he broke his leg. William claimed that he had been pushed through the doors and literally kicked out of the inn and down the steps by landlord Joseph Aldred. The latter argued that William was behaving in a disorderly fashion and he had simply ‘escorted’ him out of the door, tapping him upon his shoulder, politely opening the inner door to let him out. He had his slippers on at the time , so how could he kick William out?? Judge Woodforde at the County Court was very suspicious of Joseph’s evidence and was inclined to believe the butcher. But as there was no convincing proof of violent conduct he could not allow William’s £5 damages claim for injury and loss of ten weeks’ work. Not to be out-done by local rival Captain Gregory at the Wine Vaults, Joseph opened a ‘splendid’ new billiard room at the Harrow Inn in August 1879. Joseph was at the Old Harrow Inn until January 1881 when the premises were again put up for sale by auction, together with all its furniture, fixtures and trade utensils. Its premises, copyhold of the Manor of Ilkeston, were described as ‘commodious, including stabling, and necessary outhouses, a well laid out pleasure garden, and a very extensive yard’. The inn was bought from the Trustee in liquidation by Charles Hiram Gregory, of the Wine Vaults, who paid £2880. In March 1881 the Inn’s licence was transferred from Joseph Aldred to its new owner and into the Inn moved Herbert Gregory, younger brother of Charles, to act as manager. The Vaults under the Harrow were renovated and then offered coffee, sandwiches and other refreshments, every morning at 6 o’clock, under the management of barman Norman Straw. At the beginning of the following year the issue of “the Old Harrow Inn corner” raised its head. Writing in the Pioneer, ‘Rambler’ considered the architectural curiosity of the inn to be “an eyesore which has for generations disfigured the entrance to our Market-place, … a rendezvous for many an idle lounger whose filthy remarks have too often offended ears polite, … (and) a point of danger that has upset the equanimity of many an even-tempered but unlucky individual”. He rejoiced in the knowledge that it might now be removed. Charles Gregory had offered to sell the land on which it stood to the Local Board. Would the offer be accepted? That was not a question which the Local Board members could answer easily!! As usual there was much discussion within the group … how much of the corner should be bought? At what price? In spring 1882 Charles sold ‘the Harrow corner’ to the Local Board for £253, at £11 per square yard, so that the entrance to the Market Place might be widened. 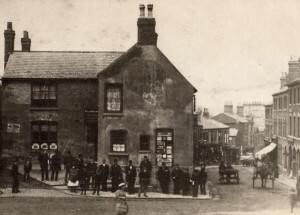 In June 1882 the inn was bought at auction by Joseph Small for £3000 who moved from the Erewash Hotel in Langley Mill, Heanor. The latter hotel was taken over by William Parker. The presence of an election poster for Samuel Leeke (Conservative) might indicate either the 1886 General Election or the 1887 By-election, both of which Samuel contested, unsuccessfully. I think that the Aldreds in Ilkeston came from one common stock, for another family of Aldreds had four sons named Isaac, Joseph, Aaron and Samuel. Adeline may be referring to the family of collier Samuel and Mary (nee Ottewell) neither of whom she would have known in Ilkeston. However they had sons Isaac, Joseph, Aaron and Samuel, all of whom lived at one time in the town. We continue our walk, going from the Inn towards the Town Hall and starting with the Harrow’s immediate neighbours.